Eaton K Series 2-Pole 3-Wire General-duty safety switch is rated at 200-Amps and 240-Volt AC. It has power rating of 15 hp at 240-Volt AC for 1-Phase and 25 - 60 hp at 240-Volt AC for 3-Phase. Switch features painted galvanized steel construction. It has visible double-break, quick-make and quick-break rotary blade mechanism for faster switching operation. Fusible switch with solid neutral, provides ample wire bending space provides for easier installation. It measures 10-Inch x 15.52-Inch x 25.23-Inch. 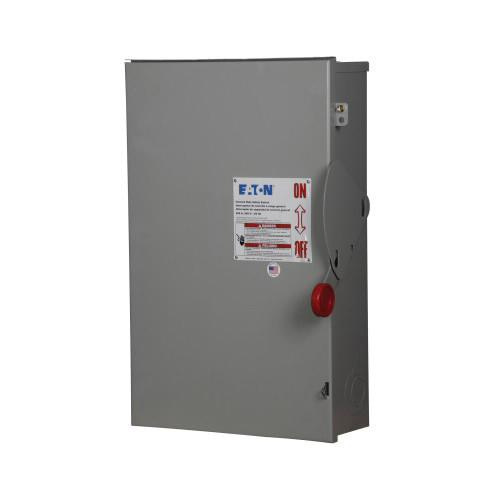 This DPST switch uses Class H cartridge fuse for providing protection to low-voltage electrical installation against short-circuit/overload current. It has mechanically interlocked cover that prevents internal device access during On position. It is perfect for residential and commercial applications. It has NEMA 3R rated outdoor enclosure for safety. Switch is UL listed.